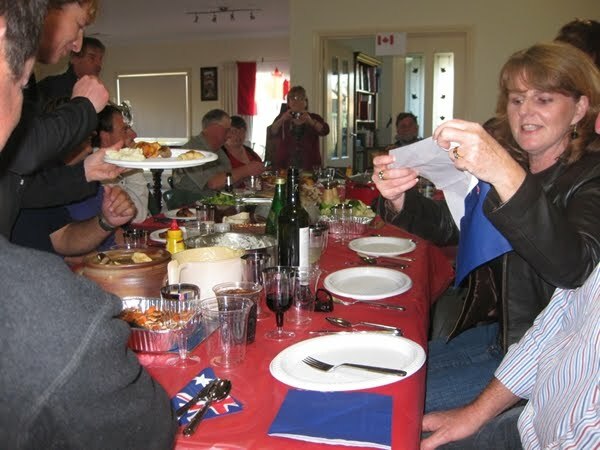 On October 16th we promised our Australian friends that we would host a traditional Canadian Thanksgiving Dinner. 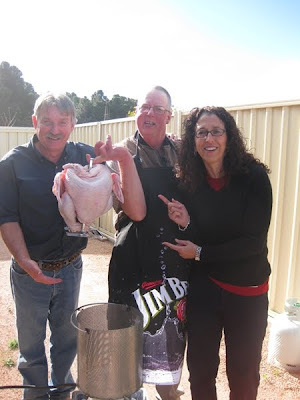 Our Aussie friends had indicated to us that they were very excited about having a Thanksgiving Dinner since they had only witnessed this special event in American movies. Sadly, they do not celebrate the thankful time of harvest. 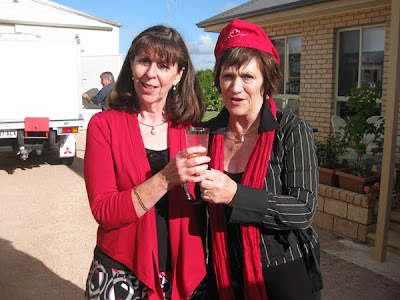 They have told us that they felt that it was a very good idea; especially in Kadina, which is a farming community. So for many, this Thanksgiving would be their first! We recognize that October 11th was officially Thanksgiving Day in Canada. However, because we had just arrived back from our holiday to Malaysia on October 10th, we elected to postpone our Thanksgiving Dinner until the next weekend. What started out as a dinner party for five people quickly expanded into a festive party of more than twenty! 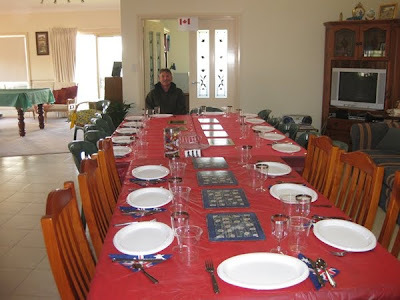 We also figured that it wouldn’t matter much whether we had Thanksgiving on the 11th or the 16th considering that this was our Aussie friends' inaugural dinner. Prior to getting started we wanted the dinner to be as traditional as possible. This meant that the dinner had to be “Sit Down Style” rather than “Buffet Style”. 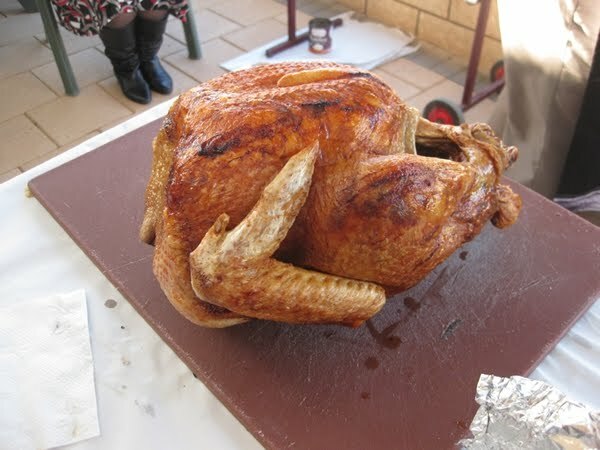 As you can imagine, with only one oven to cook the turkey, we had a number of logistical problems to overcome. How would we cook all the vegetables? How would we be able to serve the food piping hot to the table? Where would we get the tables and chairs to seat everyone? Where would we find the room to seat everyone? Where would we get the cranberries to make the sauce? Finally and most importantly, where would we get the turkey, let alone find a bird big enough for twenty people? Well not to worry….when there’s a will, there’s a way. Everyone pitched in, showed how resourceful they could be and as a result, all problems were solved and a good time was had by all. 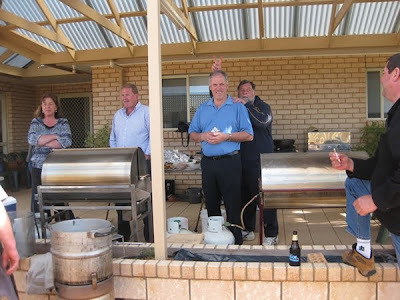 There was an abundance of food, as well as plenty of mirth and merriment. Wait, we are getting ahead of ourselves, so we’ll digress a bit and start at the beginning. 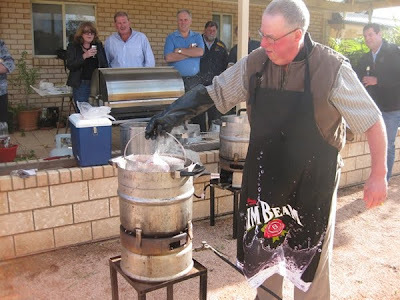 Our planning started in August with Rick busy in the kitchen making fourteen dozen perogies and heaps of cabbage rolls. Heaps is an Australian expression meaning LOTS! For example when dining with a number of Aussies, it is not unusual for someone who has enjoyed his meal, to remark that, “The food was heaps yum!” In addition to not having experienced Thanksgiving Dinner, our Australian friends had also never experienced either one of these Ukrainian dishes. Therefore, we felt it necessary that we make heaps of them and make sure that they be included on the menu. Desi, the butcher, offered to store these tasty savouries in his freezer until Thanksgiving, but advised that a storage fee was in order. To waive a rental fee, the sly and crafty Desi stipulated that he and his wife, Anne, be treated to some Ukrainian mouth-watering delectables prior to Thanksgiving. 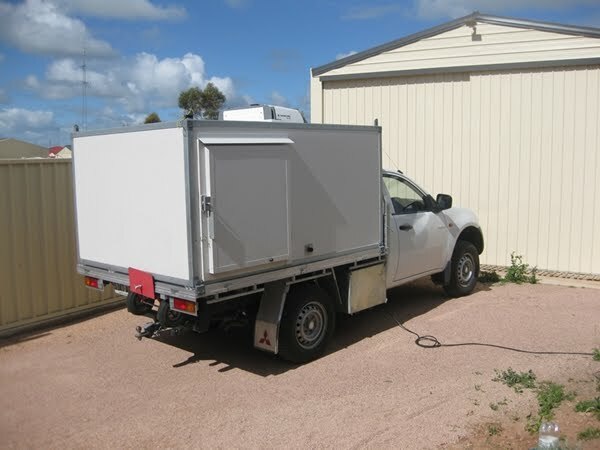 We felt that this was a good trade and it also solved our storage problem! 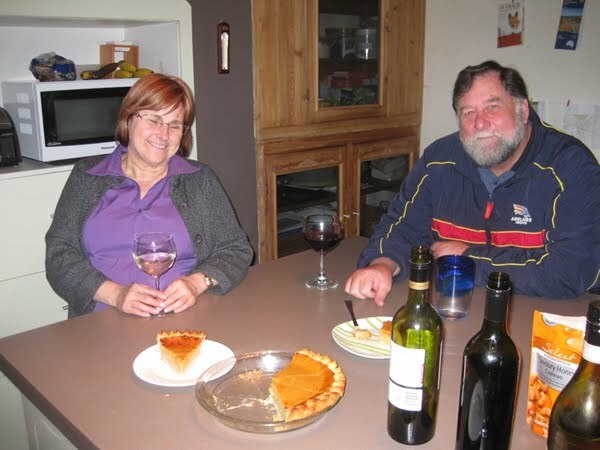 When Desi and Anne showed up for their promised dinner, we were completely astonished as Anne had made a pumpkin pie! We were surprised to learn that most Australians had never had pumpkin pie for dessert, and of course in Canada, pumpkin pie is a Thanksgiving Dinner staple. In Australia, pumpkin is considered to be a vegetable that is served with the meal. So you can imagine our astonishment when Anne arrived with pumpkin pie! We had been wondering how we were going to make pumpkin pie as there are so many different varieties to choose from, and you cannot find one can of pumpkin pie filling on any of the grocery store shelves. Anne, bless her heart and in true Thanksgiving spirit, had gone onto the Internet to learn how to make a pumpkin pie. When she arrived for dinner with pumpkin pie in hand, she asked us if this is what the pie should look like and more importantly, did it taste like pumpkin pie? We didn’t hesitate and dove into our “trial” dessert before serving our Ukrainian dinner of perogies and cabbage rolls. The pumpkin pie was a10 out of 10. Another problem had been solved! When it came to sorting out the cooking and dining logistics, everyone came to the rescue. We witnessed Aussie resourcefulness at its best! Desi really wanted to deep fry the turkey even though he had never done one before, let alone have a deep fryer big enough to house a bird to feed a hungry mob of twenty. So he built one out of an old beer keg! Desi, as well as Scott and Leon made sure that we had chairs and tables to seat everyone; a refrigerated storage truck to keep the victuals from going off, two portable ovens and barbeques to cook the feast, and finally a bain marie to ensure that the food would be served all at once and most importantly, hot. 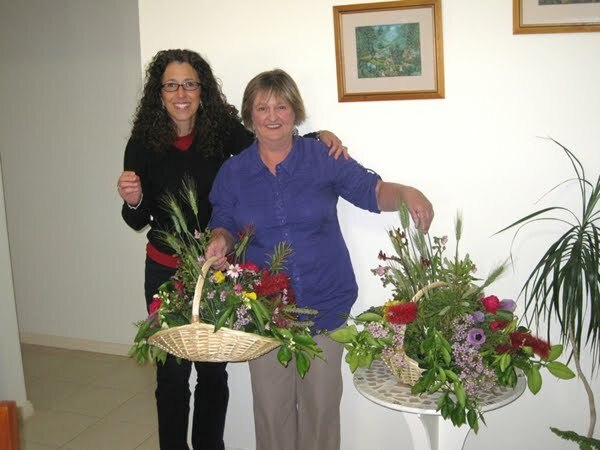 Jane made two absolutely gorgeous native flower arrangements as table centers. 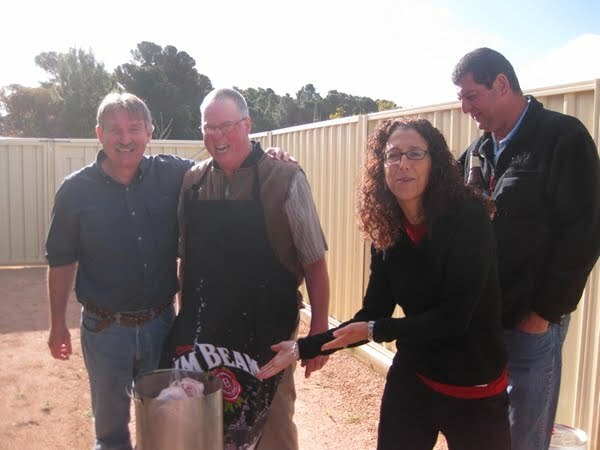 Doug and Dawn opened their home to host the meal and provided everyone with googled information on the tradition of Thanksgiving. Leon, Alli, Jill, Dawn and Desi went full tilt helping to prepare the food. The list of helpers just goes on and on. All our problems were delightfully solved with the exception of one. We could not keep Scott from stealing and sampling the sausage that accompanied the perogies. By the time dinner was being served, we discovered that there was a noticeable absence of sausage! It was Desi’s first attempt at making kobassa. We understand that it was wholeheartedly enjoyed by those who were fortunate enough to find some hidden in the pile of perogies. A sizeable serving of appetizers, appreciatively and deliciously made by Leon and Desi, kept our guests at bay while the turkey was being cooked. Spring Rolls, Samosas, Raw Oysters and Oysters Kilpatrick were delightfully devoured by all. For the main course, a beautiful ham was also baked to compliment the mouth-watering turkey. In addition to the perogies and cabbage rolls, the usual accoutrements of mashed potatoes, brussel sprouts, cauliflower, broccoli, carrots, and gravy were also served. Our guest’s were most captivated by Rick’s mother’s dish of sweet potatoes served up with marshmallows. For dessert, our guests had a choice of Blueberry Cake, Banana Bread, Pumpkin Pie, Pecan Pie and/or Quandong Pie. Quandongs are a truly unique native Australian fruit found in arid and semi-arid regions of Australia. It is used in making jams, chutneys and pies. Coffee laced with Kahlua and Baileys rounded out the evening. For us, the highlight of the dinner was the moment when everyone had their moment to give Thanks. Prior to coming to dinner, we had informed our guests that in true Thanksgiving spirit, they should be prepared to speak on why they were thankful. We had explained that this was a tradition in our family that usually took place after the main course, but before dessert. 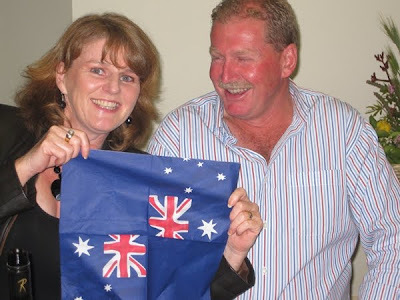 The Aussie’s embraced this custom and they were “AWESOME”! It was a true Thanksgiving moment as heartfelt moments were shared amongst friends accompanied with the usual jibes of jocularity that are usually bantered back and forth when good friends get together. It was a very special Thanksgiving and one that we will never forget! The moment before the cooking of the bird! 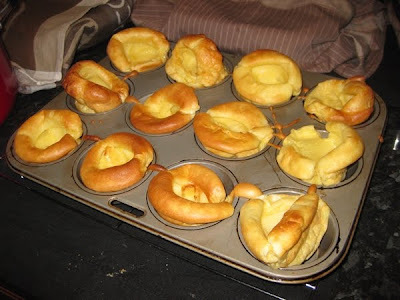 The end product – Heaps Yum! Did we forget to mention the Yorkshire Pudding?